A BIG THANK YOU to all you ladies that sent their Get Well wishes. OH GAH! I felt like death for the past week and having a fever of 104 did not help at all! But I'm finally getting back on the grind, and starting to feel like a normal person again. So I'm on freakin antibiotics that are the size of a horsepill for 10 days! Aye yeh yeh....Stupid BRONCHITIS! I felt much better on Saturday and I actually went with my mom to run errands. It was good to have that mother-daughter time. We went to Target and I saw that Beauty Blending Sponge by Sonia, I was going to pay for it, but mother insisted. Then, my mom needed a new brush and China Glaze polishes were buy 2 get 1, and mom insisted again. Man, Mom knows best! LOL! We need to spend more quality time often.. PUAHAHA! On Sunday, I felt 100x times better and so I went out to shop for my lil sis-in-law's gift. Her 9th birthday is coming up and I had to get everything to mail to Cali. After getting all her stuff, I managed to stop by Sephora to use my 15% coupon. I had to take advantage of it! How often does Sephora give coupons out? Since I sold my lovely painpots to the lovely DSK, Stephanie, I've been eyeing Benefit creaseless shadows. Plus, Megan, Haulinbroad, doesn't help! She keeps telling me that they are soo much better than paintpots! PUAHA! So I swatched and I wasn't in love with a lot of them, but I found two that I liked, which is all I need. There's no need to get the whole collection. I was going to settle for one, then I found this set and I was amazzeed! Benefit's Girl's Night In includes: a brush, Birthday Suite Creaseless Cream Shadow, Skinny Jeans Creaseless Cream Shadow, Lady's Choice Lipstick, Magnets, and the cosmetic bag. All that for $38 bucks! But since I had the coupon, it was only $32? or $33! Wee! Not bad at all considering that each creaseless cream shadow is $19 bucks each! AND! In the pic above, I'm wearing the black heart necklace from DSK, Stephanie!! Go check her out on her jewelry blog! She's simply amazing! Which leads me to this.... She spoiled me when I bought two necklaces! One black hearted and one Light Amethyst heart. OooOH man, let's not mail chocolate shall we? LOL! My mailman likes to shove everything in my mailbox and it was probably hot outside. Anyway, thank you for being so thoughtful, Steph! More detailed photos on my necklaces will be coming soon! Ookay this blog is uber long! So let's end our little journey here. Take care loves! Why hello my dears! I'm blogging from bed because I'm still sicko! I've been sick since Sunday. ERGH! I tried to go into work today, but got denied! They told me to rest again, so I'm finally going to the doctor today. Let's hope they give me some of the good stuff. I feel like I've been blowing my brains out! So I know many of you beauty blogger out there already know how to depot MAC eyeshadows, but for my other readers that have no idea, I thought this might be somewhat helpful. Or, if you're just scared or nervous to do it, don't be! It's really easy. I depot all my MAC eyeshadows and even my first quad, because if it's not in a palette, I won't use it. Plus, it's easy to travel with! For completing my NO HAUL CHALLENGE, the husby bought me 5 MAC e/s from CCO! I picked them out of course, but 4 of them are from the StarFlash collection. The orange one is from the Neo Sci collection, which is Time & Space, then clockwise, you'll see Mink & Sable, Go, Bold & Brazen, and Glamour Check. I looovee the payoff on these eyeshadows. Ookay here's another pic of an empty palette (my 2nd one!) and the rest of the e/s and quad that I depotted. Thanks to Nat, I was able to depot my Spiced Chocolate quad! WOO! So it's no longer neglected. Materials Needed to Depot: Wire cutters, knife, rubbing alcohol, magnets, paper towels, & of course, your palette. There's plenty of tutorials on YouTube that show you how to depot. But this method is pretty easy considering that I didn't use any heat! The rubbing alcohol helps loosen up the glue. If you have any questions, feel free to send me an email at jenthejunkie@gmail.com. The good thing about depotting, if you bring in 6 empty containers to a MAC counter, you get a free MAC lipstick! If you bring it to a MAC store, you can get a lipstick, lipgloss, or eyeshadow. Not bad eh? At least you're recycling! ERGH! So the the preview of my blog looks nothing like I published. Can anyone recommend a 3 part blog template website? I need to change my blog...Thanks! Ookay, my head feels like it weighs 100lbs right now! Geez, I need to lay down. Hope you guys had a lovely Easter Weekend, I know I did, but now I feel like doodoo! Take care lovelies! Self adhesive: Heaven sent! I didn't have a really hard time applying these lashes. I was very impressed! Me and glue do not mesh well, so self-adhesive is a plus for me! Price: I believe these lashes run $4-$6 at drugstores, so I think that's a pretty good deal. Removal: It's very easy to remove these lashes. Just apply makeup remover and gently pull them off. Uses: The box said you can get a couple of uses out of it, but I used it once and tossed it. They have extra self-adhesive strips, but I just didn't bother. I have to be completely honest, I did have a difficult time with these nails. I tried it the first time, and like I said, me and glue do not work well together. My second attempt was much better! Alternatives: Going to the nail salon frequently can bite your wallet, so these nails are an alternative. Design: The designs are really cute! It's like the good ol' fashion french manicure with a little oomph. The designs are still natural looking, without looking too overbea ring or flashy. Glue and Bubbles: I hate glue! I tried not to put too much glue, but then I wanted to avoid bubbles. So basically, I couldn't win. Contacts: I had gel nails professionally done in the past, and I never really had a hard time with daily activities. With these nails, I had a hard time taking of my contact lenses. I felt like I was going to stab myself with the plastic nail. I'll wrap up this review by thanking Janet at Revlon for giving me the opportunity to review her products. It was very generous of her to send a package my way. I felt like a little girl when I opened her package. Thanks again, Janet! As I was going through my "NO HAUL" challenge, I started rummaging through my makeup. I came to a sad realization. I have plenty of paint pots, but I don't reach for them often. I mostly use Groundwork and Constructivist. So that leaves me with these. I have only used them 2-4 times and I used them with a brush. With other blogger girls having sales, I decided to throw these up for sale. If no one is interested in these, it's no biggie I'm sure I'll find some use for it, swap it, or give it to my cousin. LOL! If you're interested, leave me a comment. I might even throw some extras for you. Hehe! I'll invoice through PayPal only, (once I figure it out!). So! I've been doing pretty well with this "No Haul Challenge". I've had my moments, trust me! There's been times where my husby had to pull me from the MAC counter, then saying "No, I won't let you!" LOL! Oh geez, then I started to think, am I seriously crazy? My hardest challenge was at CCO, GAH! Since all the MAC is marked 30% off, I had to resist. I'm stupid for even going in there just cause it made it worst! I even had three e/s in my hand! They were sooo pretty all from the StarFlash collection (which means they're already discontinued!). But the husby gave me the evil eye and I had to put them back. Goodness! It broke my heart. April 7th, where are you!?!? Oookay, now the reason why I've been doing pretty well is that I'm getting the lovely hookups left and right. Actually, instead of hookup, let's call it networking, plus it sounds more professional. Second, another thank you to my good friend, Kim. 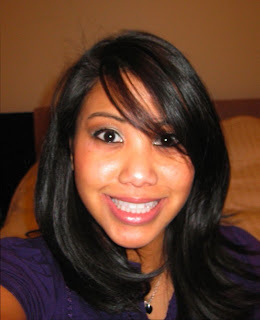 Kim works as Marketing Specialist in the beauty industry. She's also dating my brother.. Hahaha! But yes, she hooked me up with some lovely hair products. Don't you wonder why Bed Head packaging is sooo... umm.. explicit-like?! Anyways! Kim hooked me up with a liter of Prive (one of my fave shampoos that Kim introduced me to!) and Bed Head's Spoil Me! I looovvee Spoil Me! It's like an all in one type product.. Another review on this coming soon too! And lastly, I received a lovely email for Karen at Juice Beauty! I was really excited about this one because I found one of my reviews on their website. I'm really excited for what Juice Beauty has in store for everyone. Thank you for contacting me, Karen! I'm looking forward to received my tinted moisturizer from Juice Beauty. OoOoH yeah! ONE MORE THING! I totally forgot to mention that I won Crest Whitestrips from Vanessa's blog! Thank you, Vanessa!!! I haven't tried them yet, but I will do it soon to keep up with the pearly whites! I know I haven't posted in awhile. I've been M.I.A., I was really just trying to spend as much time with the husby because he was supposed to leave for 2 months for work. Keyword, "supposed". Yes! We received news that the boat is no longer leaving! WOOHOOO! I'm seriously one lucky girl! So now I get smother him even more! Ookay, that's all for now. Hope you didn't forget about me! Reviews will be coming soon..